Naturally, the building of any plastics comes with an element of customisation and conversion. 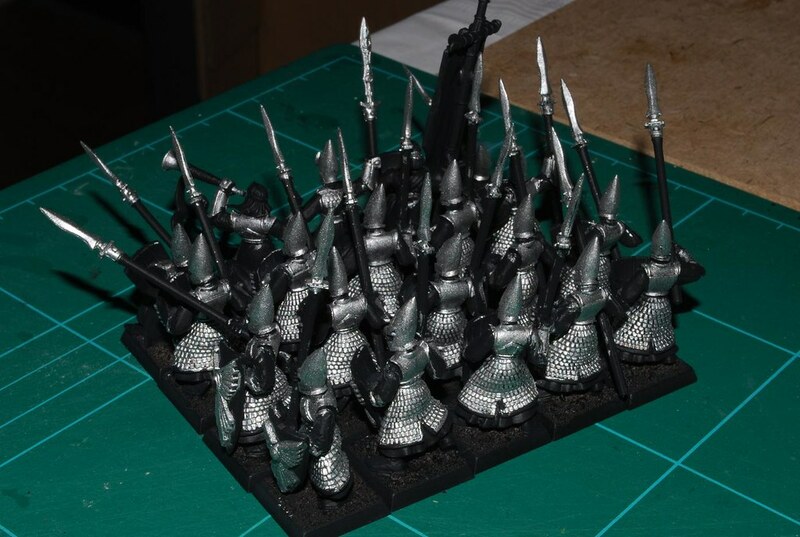 My overall plan when modeling this unit was to demonstrate their martial prowess and ability to fight in multiple ranks. 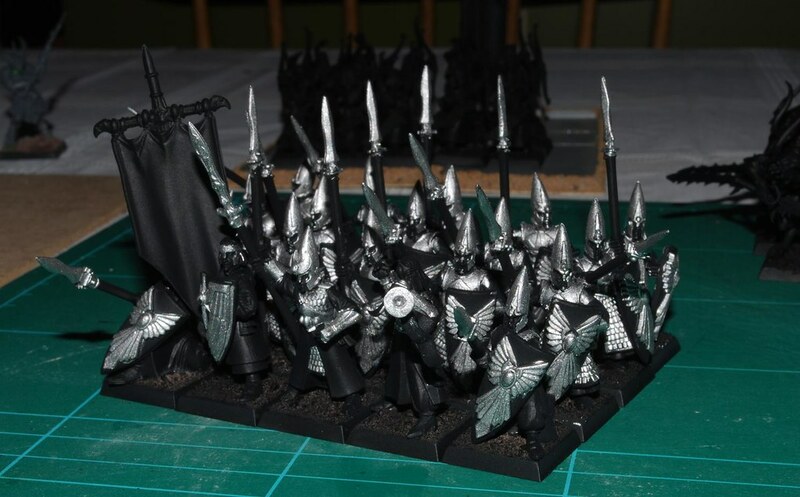 With the battleforce as my source of models and components this included kneeling front rank spears with the archer bodies, the rest of the ranks were posed to be trusting spears and looking to the front and flanks to form a bristling wall of spearheads and a more dynamic unit. This may not be displayed well with the picture above, but more pictures to come. 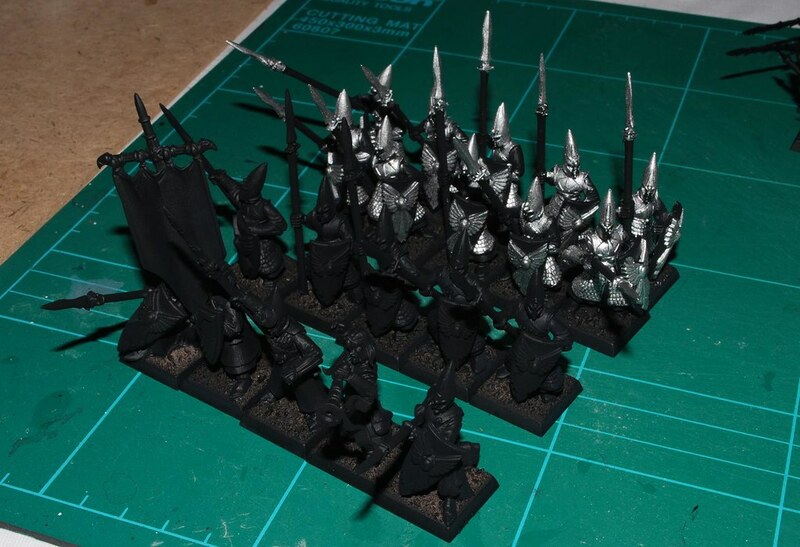 Another use for the wealth of swappable components in the battleforce is the Bolt Thrower crew bodies, these I tend to use amongst my command unit as below. 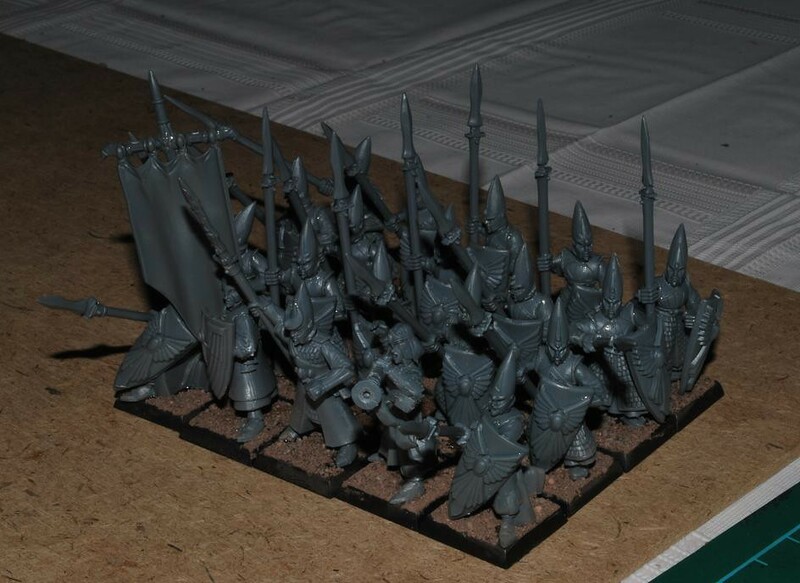 The arrow loading goons can always make do with regular spearmen armour. Note the simple champion spear made by replacing the spearhead with runed blade of the generic champion sword. Far more of a distinctive spearman champion than a "I'm going to stand in the front rank waving a sword for attention" usual rank and file champion. If the champion is distinctive, we can only describe the long haired musician as 'flamboyant'. 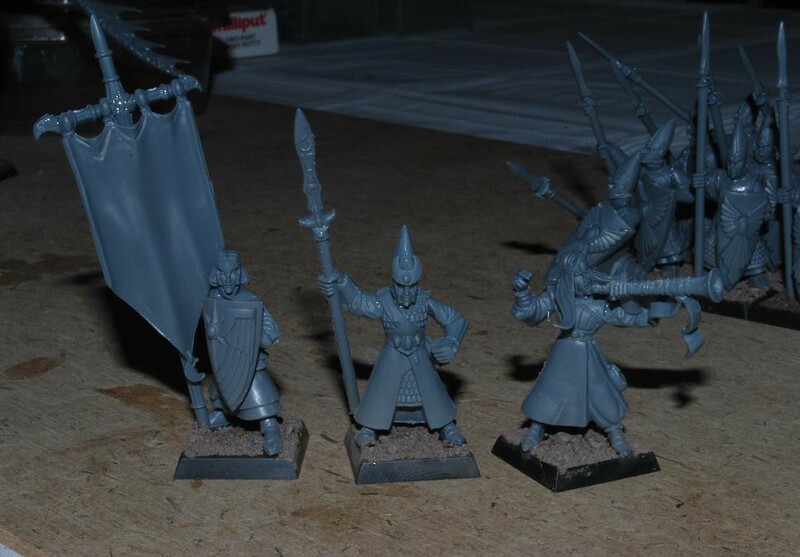 As for the standard bearer I like the very staunch and shielded pose and will continue this throughout the army. 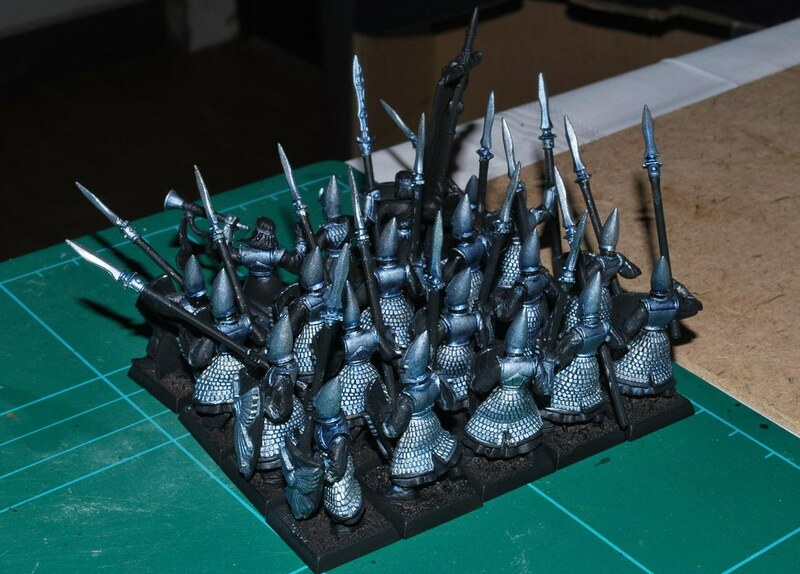 Spearman models are mostly metals, scale armour skirts, shiny breastplates, wrist guards, and speartips. With this in mind the first base color is to be a metalic, this can them be inked and glazed quickly with no required care of other parts of the model. I use a complete Wargames Foundry paint set so these colors may be unfamiliar to many, but I certainly recommend these. As you see I am pretty scruffy with my bases colors but this is all tidied up later. 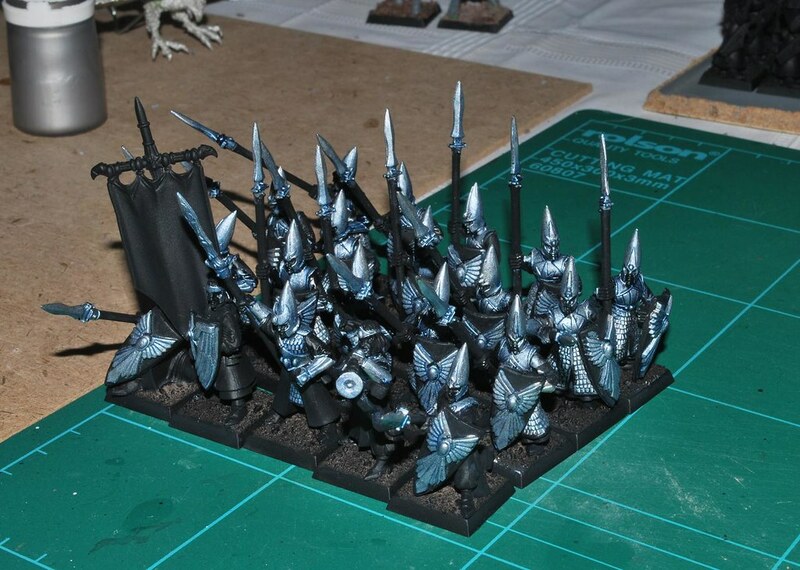 Games Workshop inks action here, firstly two coats of Asurmen Blue. Leaving a coat of ink or a wash to dry and applying a second coat will always build up a far greater defination of shading. This takes up time over the day but theres always other bits to work on. This provided quite a strong tint that should blend in with the overall color scheme. 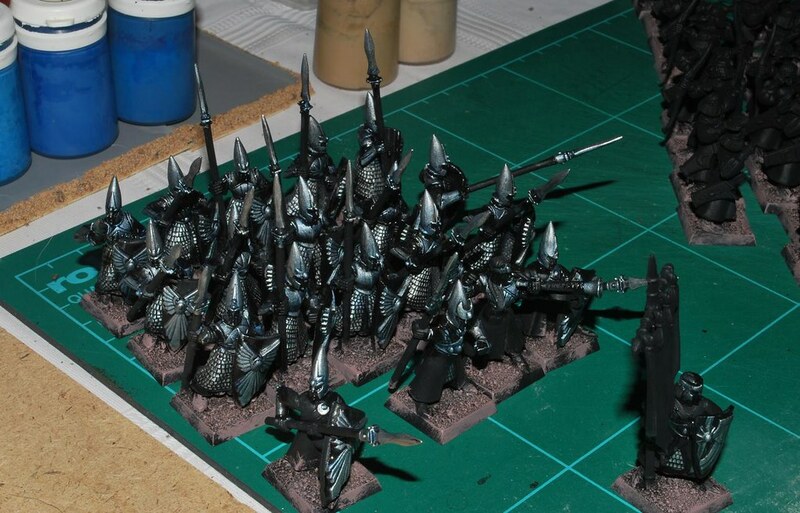 Once dry again a final ink of black was used to define the armour, specifically the scales. 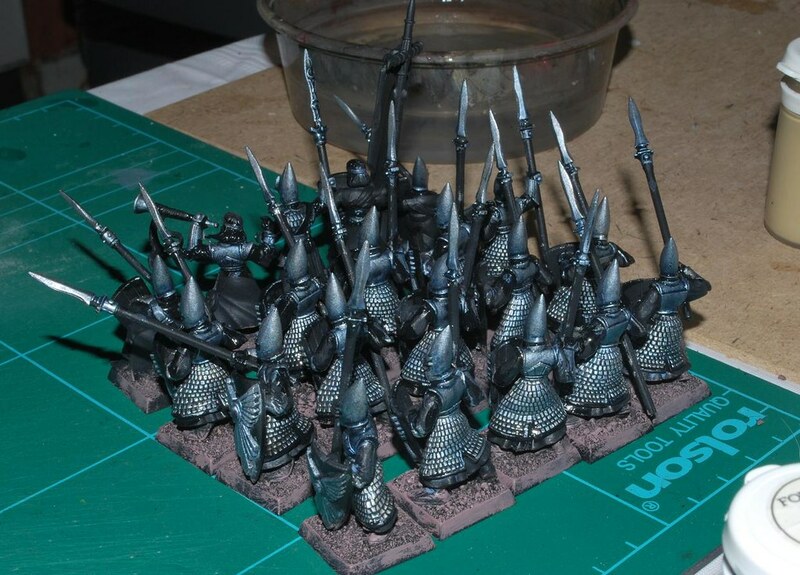 Talking of letting coats dry I have completed the base drybrush of the bases at this point with 'Peaty Brown Light'.